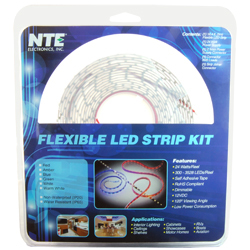 These great new Flexible LED Strip Starter Kits are packaged in a durable blister package and contain everything you need to plug in and illuminate your project. Available in Red, Amber, Blue, Green, White, and Warm White, as well as 3 different LED sizes (2835, 3528, and 5050). All kits contain indicated LED strip, recommended power supply, and associated connectors.